Daihatsu EB Series Exhaust Manifold Gasket S80 Series. 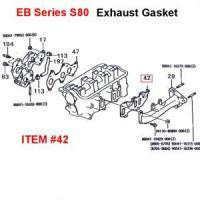 Include VIN number when ordering Daihatsu EB Series Exhaust Manifold Gasket S80 Series. Prod Dates: 1986/05 to 1990/04 Fits both Truck & Van. OEM PN: 17173-87207 or 17173-87225 Item #42 in diagram. All other components sold separately.